Allow me to introduce you to one of the most important inhabitants of Mallorca, in fact, one of the most important creatures anywhere in the world: the Common Earthworm, or Lob worm (Latin: Lumbricus terrestris, Catalan: Cuc de terra, Castellano: Lombriz de tierra). 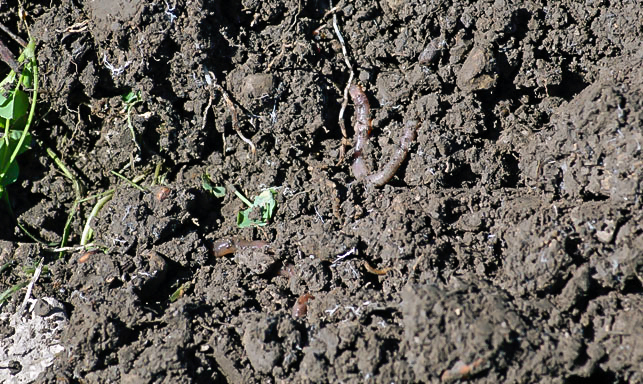 Earthworms play a major role in the agricultural environment because they are involved in many soil processes such as soil turnover, aeration and drainage, as well as the breakdown and incorporation of organic matter. Without the busy labour of these wriggly creatures, there would be hardly any life in our gardens or farms; plants and trees would find it difficult to survive, and the ecological balance of nature and in agriculture would be jeopardized. The photo was taken near Felanitx, Mallorca, Baleares, Spain. The date: March 27th, 2010.